The world of Europa Universalis IV is divided into provinces which are grouped into areas, regions, super-regions and continents. These groupings play a big part in the game as they are often used as scope triggers for the various scripted events, decisions, and similar. Each ordinary land province belongs only to one area, which belongs to one region, which itself belongs to one super-region (also referred to in-game as subcontinent). This makes it easier to discern at a glance what "makes up" a region and a province's value when considering mission goals, territorial claims, Victory cards, etc. The smallest of the groupings - the area - comprises two to five provinces. They are usually based on historical context and have a tendency to be around the same development levels within their region. The division of provinces into areas is the basis for the territories and states mechanic. In addition to those groupings, every land province (including wastelands) also belongs to one continent. Continents bear no special relationship to regions or super-regions, and even areas can cross continental borders. Every sea province belongs to an area within a region, but these sea regions do not have any super-region. Sea regions are the basis for many naval missions that do not involve trade nodes. 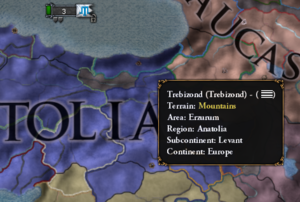 Overlapping regions may be added to the game by modding a special file, but are not present in the unmodded game. Note: A super-region and a continent bearing the same name do not necessarily have the same scope. If a nation owns land which is disconnected from its capital, it will display the nation's name following the location's name. The feature can be turned on/off through the General Options sub-menu. Exclaves that are part of the same region as the capital will still display the nation's name. Example: France. Exclaves that are small and belong mostly to one area will add the area's name. Example: French Alexandria. Exclaves that are large and belong mostly to one region will add the region's name. Example: French Egypt. Exclaves that are very large, with no one region containing half its provinces will add the super-region's name. Example: French Middle East. Hovering over provinces in the Regions or Areas map mode shows all the groups the province belongs to. There are two map modes that are used to view some of the groupings. The Areas map mode will color code all the areas, and the Regions map mode will color code all the regions, highlighting only the region's areas when selecting a certain region. There is no map mode to view super-regions or continents, but it is still possible to determine a province's super-region (called subcontinent) or continent by hovering over the province in any of the previous map-modes. A continent is a closed landmass of the earth. Each land province (including wastelands) belongs to one continent. A few sea zones also belong to a continent, but most by far do not. Inland sea zones indicated in turquoise (Simple Terrain map rendition). The below list of areas is divided into land and sea area with further division into regions. Clicking on a region name will lead to a more detailed province page. To find a specific area fast use Ctrl+F or browse the list. ↑ from Latin: terra continens “continuous land”.